Crisping your skin on a sun bed or shivering in paper knickers while a stranger sprays you orange, isn’t for everyone. Yet law (or lore) dictates other holiday makers will be scrutinising your skin like a treasure map; so spruce it up like a tattered old beach kaftan we must. Luckily, there’s a far more adorable way to get your summer glow this year and you can drop it into your basket during your next Superdrug run. Listen closely and you may hear the squidgy footsteps of gummy bear feet as an army of them parade into reasonably priced health and beauty retailers nationwide. Suitable for vegans – and with no artificial flavourings – these chewy little helpers will shine you up from the inside like a glorious bronzed ornament. 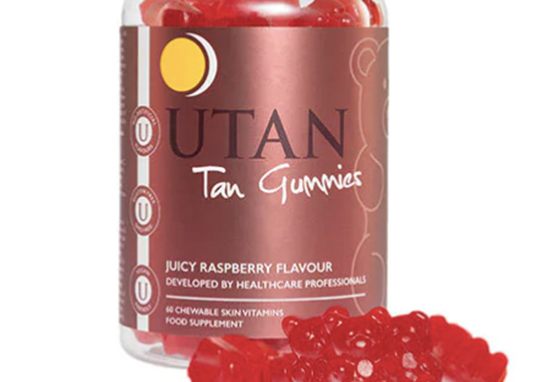 Developed by Company UTAN & Tone, Tan Gummies should be sucked until dissolved or else chewed and swallowed. With a delectably juicy raspberry flavour, this part shouldn’t be too taxing. The world’s first edible tan supplements developed by healthcare experts using tried & tested, traditional vegan ingredients. Patent Pending Tan Gummies® help to accelerate & enhance the perfect bronze tone to pale skins, with & without the sun. GMO Free. Gluten Free. Tan fans are advised to take two bears a day for around two to three weeks before they plan on taking their bods poolside. Once you’ve reached your dream shade – a dilemma if ever there was one – you should begin to reduce your daily bear intake. Tan Gummies® allow potent actives to be held in the buccal cavity for a considerable time, resulting in ‘direct absorption’ through the membranes in the cheek walls. Vit C to help with the formation of collagen in skin; Zinc & Riboflavin for the maintenance of normal skin. Those who’ve already had a nibble, appear delighted with the result. 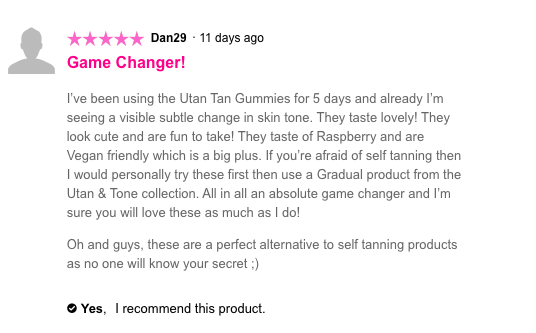 I’ve been using the Utan Tan Gummies for 5 days and already I’m seeing a visible subtle change in skin tone. They taste lovely! They look cute and are fun to take! They taste of Raspberry and are Vegan friendly which is a big plus. If you’re afraid of self tanning then I would personally try these first then use a Gradual product from the Utan & Tone collection. All in all an absolute game changer and I’m sure you will love these as much as I do! You can pick up a jar of 60 bears for £18 at your local Superdrug store.